Heir of the See of Peter, the Prince of the Apostles, thou presidedst over the Church: thou hadst his spirit, and wast inflamed with zeal for the Faith. Thou, as a dazzling sun, didst rise in the west: thou wisely dispelledst the error of Eutyches, who mingled and confused the two Natures, and that of Nestorius, who divided them. Thou taughtest us to adore one Christ in two Natures, inseparably, unchangeably, unconfusedly united. O God, who didst give to thy people blessed Leo, for a minister of eternal salvation; grant we beseech thee, that he who was the instructor of our life here on earth, may in heaven become our intercessor. Through our Lord Jesus Christ, thy Son, who liveth and reigneth with thee, in the unity of the Holy Ghost, God, world without end. Amen. 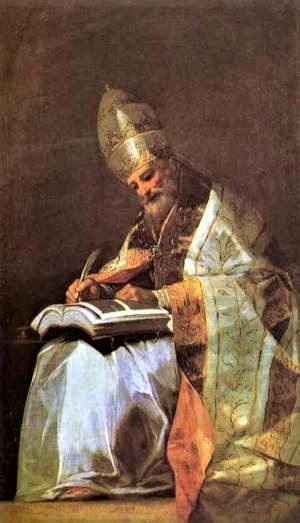 He deserved the appellation by what he did for maintaining the faith regarding the sublime mystery of the Incarnation. The Church had triumphed over the heresies that had attacked the dogma of the Trinity, when the gates of hell sought to prevail against the dogma of God having been made Man. Nestorius, a Bishop of Constantinople, impiously taught that there were two distinct Persons in Christ,—the Person of the Divine Word, and the Person of Man. The Council of Ephesus condemned this doctrine, which, by denying the unity of Person in Christ, destroyed the true notion of the Redemption. A new heresy, the very opposite of that of Nestorianism, but equally subversive of Christianity, soon followed. The monk Eutyches maintained, that, in the Incarnation, the Human Nature was absorbed by the Divine. The error was propagated with frightful rapidity. There was needed a clear and authoritative exposition of the great dogma, which is the foundation of all our hopes. Leo arose, and, from the Apostolic Chair, on which the Holy Ghost had placed him, proclaimed with matchless eloquence and precision the formula of the ancient faith,—ancient, indeed, and ever the same, yet ever acquiring greater and fresher brightness. A cry of admiration was raised at the General Council of Chalcedon, which had been convened for the purpose of condemning the errors of Eutyches. “Peter,” exclaimed the Fathers, “Peter has spoken by the mouth of Leo!” As we shall see further on, the Eastern Church has kept up the enthusiasm thus excited by the magnificent teachings given by Leo to the whole world. The Barbarian hordes were invading the West; the Empire was little more than a ruin: and Attila, “the Scourge of God,” was marching on towards Rome. Leo's majestic bearing repelled the invasion, as his word had checked the ravages of heresy. The haughty king of the Huns, before whose armies the strongest citadels had fallen, granted an audience to the Pontiff on the banks of the Mincio, and promised to spare Rome. The calm and dignity of Leo, who thus unarmed confronted the most formidable enemy of the Empire, and exposed his life for his flock,—awed the barbarian, who afterwards told his people, that, during the interview, he saw a venerable person standing, in an attitude of defence, by the side of Rome's intercessor:—it was the Apostle St. Peter. Attila not only admired, he feared the Pontiff. It was truly a sublime spectacle, and one that was full of meaning;—a Priest, with no arms save those of his character and virtues, forcing a king, such as Attila was, to do homage to a devotedness which he could ill understand, and recognise, by submission, the influence of a power which had heaven on its side. Leo, single-handed, and at once, did what it took the whole of Europe several ages to accomplish later on. That the aureola of Leo's glory might be complete, the Holy Ghost gifted him with an eloquence, which, on account of its majesty and richness, might deservedly be called Papal. The Latin language had, at that time, lost its ancient vigour; but we frequently come across passages in the writings of our Saint, which remind us of the golden age. In exposing the dogmas of our holy Faith, he uses a style so dignified and so impregnated with the savour of sacred antiquity, that it seems made for the subject. Let us now read the sketch of the Saints' life given by the Church in the Matins of the Feast. Leo the First, a Tuscan by birth, governed the Church at the period when Attila, the king of the Huns, surnamed the Scourge of God, was invading Italy. Attila pillaged and burned the city of Aquileia, which he took after a three years' siege. This done, he rushed on towards Rome as a wild firebrand. He had reached the place where the Mincio joins the Po, and was on the point of ordering his troops to pass the river, when he was met by Leo, who was moved with compassion at the misfortunes that were threatening Italy. Such was his superhuman eloquence, that he induced Attila to retrace his steps. When asked by his people, how it was, that, contrary to his custom, he had yielded such ready obedience to the demands of the Roman Pontiff, the king answered, that he beheld, whilst Leo was speaking, a personage clad in priestly robes, who stood near, with a naked sword in his hand, and threatened him with death unless he obeyed the Pontiff. Whereupon, he returned to Pannonia. Leo was welcomed back to Rome amidst the exceeding joy of all. A short time after, when the City was invested by Genseric, the Pontiff's eloquence and reputation for sanctity had such influence on the barbarian, that he abstained from setting fire to the buildings, and forbade his troops to insult or massacre the inhabitants. Seeing the Church attacked by several heresies, and mainly by the followers of Nestorius and Eutyches, he called the Council of Chalcedon, in order to remove error and vindicate the Catholic faith. Six hundred and thirty Bishops assisted at this Council, in which Eutyches, and Dioscorus, and Nestorius were condemned, (this last, a second time.) The Decrees of the Council were confirmed by the authority of Leo. The holy Pontiff then turned his attention to the reparation and building of Churches. It was through his persuasion, that a pious lady, called Demetria built the Church of Saint Stephen on her own land on the Latin Way, three miles out of the City. He himself built one on the Appian Way, and dedicated it to Saint Cornelius. He repaired several others, and refurnished them with all the sacred vessels needed for the divine service. He built vaults under the Basilicas of Saint Peter, Saint Paul, and Saint John Lateran. He appointed guards, to whom he gave the name of Cubicularii, to watch at the Tombs of the Apostles. He ordered that these words should be added to the Canon of the Mass: Holy Sacrifice, spotless Host. He decreed that a Nun should not receive the blessed veil, unless she had observed virginity for forty years. After these and other similar admirable acts, and after writing much that was replete with piety and eloquence, he slept in the Lord, on the third of the Ides of April, (April 11th). He reigned as Sovereign Pontiff twenty years, ten months, and twenty-eight days.